USC Kaufman BFA dance majors have worked with over 45 artists since the program’s launch in 2015. Through master classes with companies passing through Los Angeles on tour, residencies with master choreographers’ muses, and discussions with directors, students have accessed a wide scope of expertise in dance and professionalism. From the studio to the stage, master classes and residencies have spanned styles, specialties, and even seas, with artists from all over the world. 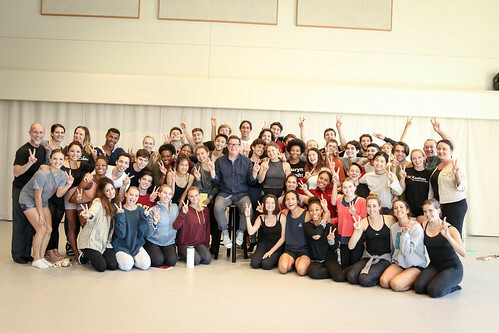 The BFA class of 2019, now in their junior year, met faculty member William Forsythe on their very first day of class in fall 2015. After ballet class with Forsythe and vice dean Jodie Gates, and hip-hop with professor d. Sabela Grimes, they launched into rehearsal with Complexions Contemporary Ballet co-artistic director and faculty artist in residence Desmond Richardson, who set Dwight Rhoden’s Red: The Force. As the semester progressed, they worked with another faculty artist in residence, Zippora Karz, on Balanchine repertory and with Tobin del Cuore on Alejandro Cerrudo‘s Lickety-Split. Later that year, they would learn Martha Graham’s Helios with Tadej Brdnik and create a new version of Story/Time with Bill T. Jones himself. 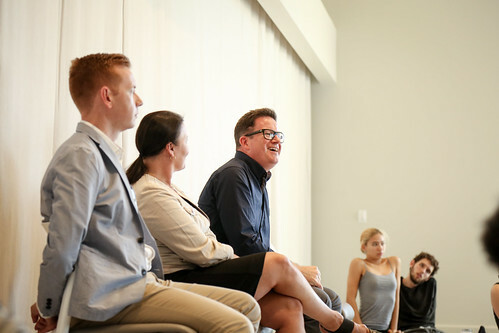 They began the spring semester with faculty artist in residence Victor Quijada, founder and artistic director of Montreal’s RUBBERBANDance Group. Quijada has returned every year since to build upon his movement language, spending three weeks in residency with BFA students. Now, sophomore and freshman BFA students have had the chance to explore the RUBBERBAND Method and apply its principles to their own movement qualities. 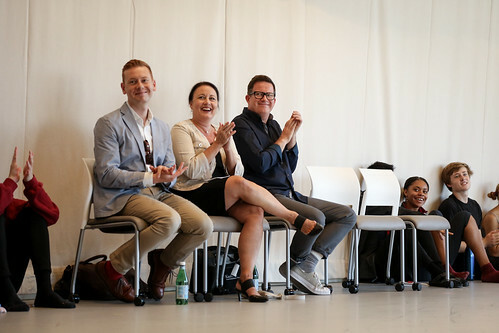 “In Quijada’s class, we are meticulously investigating all of the subtle nuances as well as the vitality in exploring and embodying the space,” said freshman Evan Sagadencky. Quijada is one of several artists in residence who work annually with USC Kaufman BFA students, impacting the long-term development of artistry and technique. Also among these faculty artists in residence is Fiona Lummis, who set Jiří Kylián’s Symphony of Psalms in 2016, then set his work Sarabande and Falling Angels the following year; this year, she is coaching BFA freshman, sophomores, and juniors in Kylián’s Forgotten Land. USC Kaufman students often work with repetiteurs like Lummis, who have learned the dance directly from its choreographer—from Taylor to Rhoden, the faculty and faculty artists in residence have the ability to pass on the work’s original intentions. Sometimes, students are given the chance to work directly with a choreographer. Dwight Rhoden, for example, worked with BFA freshman for a week this fall on his work Hissy Fits, which they learned from Complexions member Clifford Williams. Desmond Richardson also provided coaching based on his experience with Hissy Fits during a few visits to USC Kaufman this semester—along with Red: The Force, he also taught Rhoden’s Gone for a BFA repertory performance last spring. Rhoden repertory is not Richardson’s only area of expertise. Formerly a dancer with the Frankfurt Ballet under the direction of William Forsythe, he also taught an excerpt from The Vertiginous Thrill of Exactitude for this semester’s midterm showing—he was part of the piece’s original cast. BFA students learn Forsythe work in a multitude of different ways—sometimes, from dancers who worked with him in the Frankfurt Ballet or The Forsythe Company, and sometimes, alongside Forsythe himself. While he created a new work for Dance On last fall, BFA students were able to workshop choreography with Forsythe and collaborators Christopher Roman and Jill Johnson. At the same time, “Fall For Forsythe” brought Forsythe collaborators Norah Zuniga Shaw, Rubberlegz, and Riley Watts. After they helped demonstrate Forsythe’s research techniques in Focus Forsythe, dancers took a field trip to The Music Center for Celebrate Forsythe. 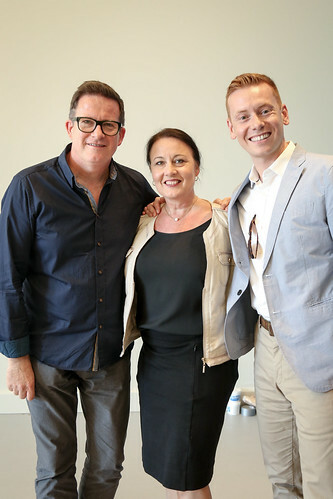 Later, she and her peers would work with Ayman Harper on Forsythe’s Enemy in the Figure, and this semester they would workshop choreography with Forsythe again on newer works 212 and Unstuck. Other choreographers visit for a short period to reset their own original works on BFA bodies—this fall, Barak Marshall set his work Monger, and Jonathan Alsberry and Aszure Barton set BUSK, all on sophomores and juniors. BFA students have also created roles during their time as undergaduates; YNOT, Raphael Xavier, Jon Boogz, Sonya Tayeh, Christopher Scott and Jessica Lee Keller have set original works at USC Kaufman. These works are tailor-made for the students, usually in a three-week period of residency. The dancers then perform the work during repertory showings, and sometimes in smaller informal showings in the studio. The students at USC Kaufman work with more than just artists in residence, however. Often, artists will visit for a day or two to share knowledge while on tour in Los Angeles. 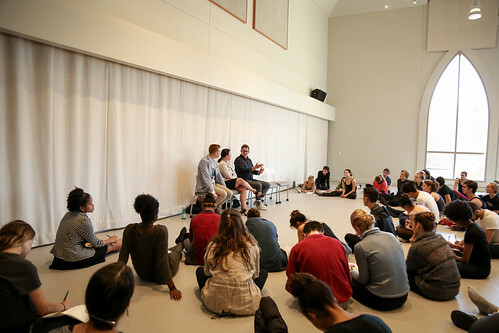 Question and answer sessions are common with company directors—in their first year, BFA juniors enjoyed master classes and salons with LINES Ballet’s Alonzo King, Hubbard Street’s Glenn Edgerton, Mariinsky’s Yuri Fateev and Diana Vishneva, and New York City Ballet’s Tiler Peck, who would return with Jared Angle the next year. Philosopher Alva Noe visited for a day of discussion, and directors Janeen and Michael Damian stopped by to watch a rehearsal and answer a few questions. Cloud Gate Dance Theatre visited while performing at The Music Center, and the students took master classes with Cunningham dancer Silas Reiner and Ailey dancer Hope Boykin. Boykin was so popular with the students that she returned the next year to teach two classes of dancers when Ailey’s tour hit The Music Center. In addition to Boykin, Lil Buck and Jon Boogz taught a day of Memphis jookin’ and popping classes. Students took master classes with Jessica Lang, PNB’s Peter Boal, and choreographer Stretch, and worked with Brian Brooks and Wendy Whelan for a few days. They later spent a week with Dana Caspersen working on conflict resolution. 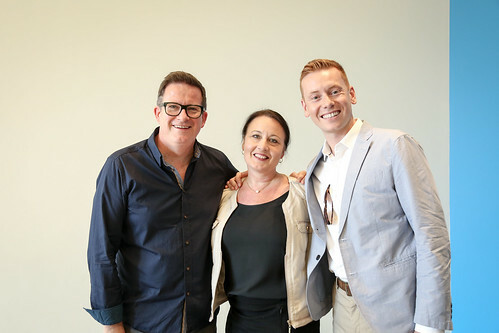 Sir Matthew Bourne watched a studio rehearsal, and talked with dance majors about applying acting skills to their performance. Master classes with Akram Khan, Malpaso’s Osnel Delgado, and Ballet BC’s Emily Molnar set the stage this fall for even more master classes this spring—Kidd Pivot, as well as Lucky Plush Dance Company and Andrew Winghart taught full master classes, and Spenser Theberge and Jermaine Spivey taught a series of movement classes. Whether through a reoccurring residency or an hour-long master class, the artists that pass through USC Kaufman supply dancers with the tools necessary to develop their own artistry. They teach more than just steps and counts; the sheer volume of movement vocabularies, unique styles, and professional advice bring breadth and depth to the BFA curriculum. While students are kept busy with their core technique and dance history classes, they constantly create new memories and new movement with the next visiting artist on the list.